The Jichangyuan, also known as Qinyutm Garden, is a 15-mu garden in the Xihui Park in the western suburb, with the Xishan Hill and the Huishan Temple in the neighborhood. Jichangyuan is a Ming-dynasty garden renowned for its unique and state-of-the-art landscaping style. Qin Jin, an all-important official of the Ming Dynasty, owned the garden when it was originally built during the Zhengde Reign (1506-1521). After repeated repairs and expansions, it emerged to become one of the best gardens in the former states of Wu and Yue. 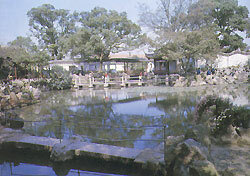 The Qins, having owned the garden through the generations, finally donated it to the state in 1952. With the Huishan Hill in the west and the Xishan Hill in the south, the garden is tucked away in a picture-perfect environment. The Longguang (Dragon's Light) Pagoda towers over the garden in the distance. Spring water flows down the Huisban Hill and empties itself in a pool in the garden. Artificial mountains are built in a way to resemble a continuation of the Huishan Hill. 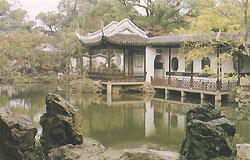 The Jichangyuan Garden is a fine example in incorporating natural scenes in its environment. The entire garden is centered on the Jinghuiqi Pool and the artificial mountain on the western shore of the pool, with pavilions, halls and chambers laid out on the eastern and northern sides of the pool. Tall trees heap up rich piles of foliage, rendering coolness and tranquility to the garden, which also fascinates the visitor with its superb stonework, well-knit structures, and tasteful treatment of views around the pool. Both emperors Kangxi and Qianlong had made six inspection tours of south China, and on each tour they made it a point to stop by the Jichangyuan Garden. Their visits have endowed the garden with numerous anecdotes and famous calligraphic works.